Michael Pronko is a Tokyo-based writer of murder, memoir and music. 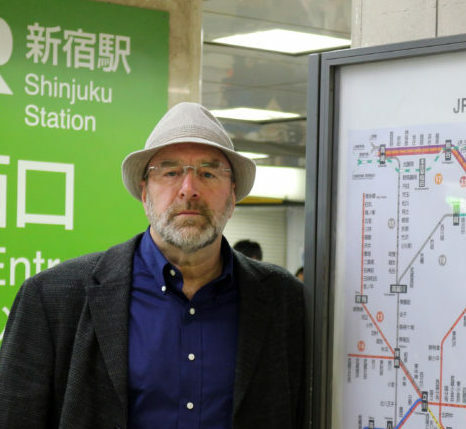 His writing about Tokyo life and taut character-driven mysteries have won awards and five-star reviews. Kirkus Reviews selected his second novel, The Moving Blade for their Best Books of 2018. The Last Train won the Shelf Unbound Competition for Best Independently Published Book. Michael runs the website, Jazz in Japan, which covers the vibrant jazz scene in Tokyo and Yokohama. During his 20 years in Japan, he has written about Japanese culture, art, society and politics for Newsweek Japan, The Japan Times, and Artscape Japan. He has read his essays on NHK TV and done programs for Nippon Television based on his writings. A philosophy major, Michael traveled for years, ducking in and out of graduate schools, before finishing his PhD on Charles Dickens and film, and finally settling in Tokyo as a professor of American Literature at Meiji Gakuin University. His seminars focus on contemporary novels, short stories and film adaptations.